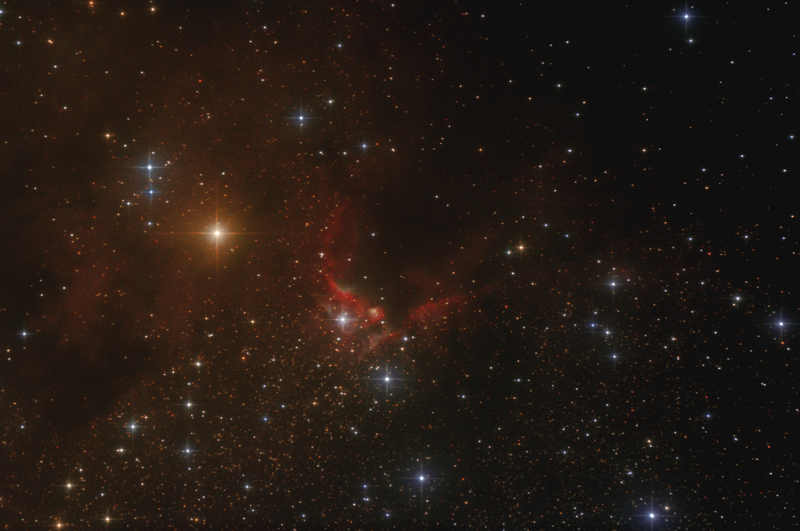 Here is a reprocess of a Cave Nebula shot from the summer. I reprocessed the shot while testing some new tool in the latest beta release of Images Plus. Click on the image to see the earlier processing. Click again to return to the original. The starting and mouse out image is a reprocess using new tools available in the latest beta release of Images Plus. Calibration and stacking done using the auto DSLR image processing. Next an arcsin stretch with colour expansion was used to provide an initial stretch. SMI processing was applied with the blurring of the top layer done with a frequency domain lowpass filter. Colour noise reduced using a colour combine with a frequency domain filtered colour layer. Masked contrast layers were used to boost the image contrast and micro curves with a soft light combine was used for the final contrast boost. A masked star reduction pass and binning produced the final image seen here. The new arcsin stretch makes it easy to get the initial stretch and the colour expansion makes it easier to hold colour while stretching. The frequency domain filtering allows very fine control over the blurring and noise filtering. The original image is an earlier processing attempt with calibration, stacking, DDP, masked contrast enhancement, high pass filtering, masked star reduction in Images Plus 5. Masked star halo reduction using the selective colour luminance mask tool in Images Plus 5. Masked noise reduction applied in Paint Shop Pro . Image binned to resize for web display in Images Plus.